You must be a garden, 'cause we're digging you Addictees! Now that we've got that out of our system, remember the show “Heroes”, the American sci-fi series where a bunch of superhumans kept running around saying, “Save the cheerleader. Save the world!”? That phrase and Hayden Panettone (Panettiere) dating Milo Venti Cappuccino (Ventimiglia) - scandalous according to E! News - is pretty much what’s left of the show in our memories. Frankly, we can’t remember if the cheerleader was looking to throw her nuclear pompoms at the ozone layer or how exactly she was planning to ‘save the world’. Replace ‘cheerleader’ with trees and we can talk real heroes. Quite simply, no trees, no world. Without them, there’d be none of this “Bruce and Beryl sitting in a tree k-i-s-s-i-n-g.” Nope – nada – zilch. You all know what else they’re good for so you don’t need us preaching at you. And now, to the point. Addicted’s Anthea Missy recently produced two prints: 'Save Our Trees, Save Us' and 'Natura est ars Dei' based on her original street art murals (see below for vids). Yes, we get the irony: prints = paper = murder / death / kill to the trees BUT, for every print sold, Anthea is donating USD $10.00 to OneTreePlanted.org where USD $1.00 plants 1 tree in the region of your choice (North America, Latin America, Asia and Africa). One Tree Planted will pool the donations for each project and send the funds to its reforestation partner enabling them to get the trees in the ground. Cool right? Not only will you get a groovy print, you can wear the tree planting badge of honour. It’s a win-win and high-5s all 'round! But wait, there's more! 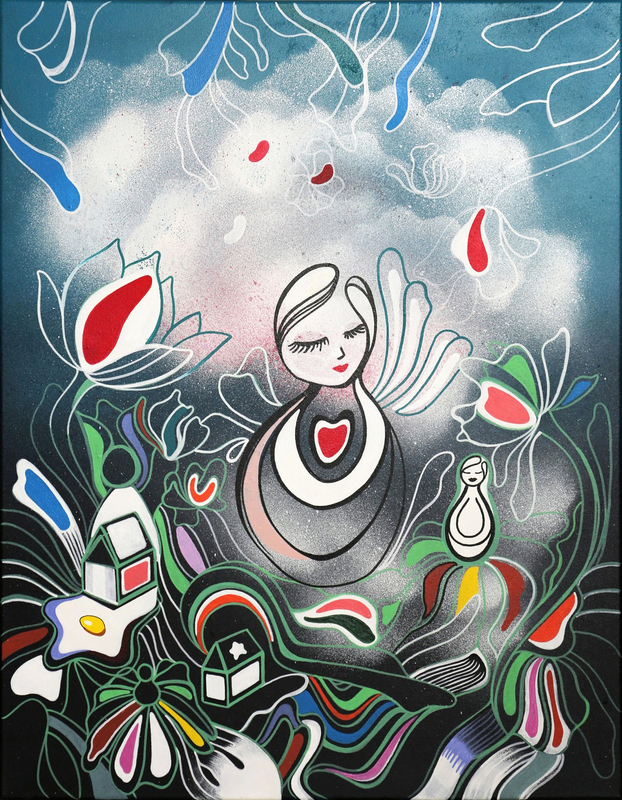 Anthea will also donate USD $100 from the sale of Mother Earth (original on canvas) from her Love and Beyond series. We're feeling greener already! Check out the bits below for details. Anthea Missy's mural in Hackney Wick, East London titled "Natura est ars Dei" - Nature is God – shows a female character touching leaves of a tree where the trunk is also a human arm. The symbol seeks to convey the connection between Mankind and Nature. Good To Know: Ships directly from the artist studio, accompanied by a CoA (Cert. of Authenticity) signed by the artist. Arty-Fact: ‘Natura Est Ars Dei’ – God Is Nature, is inspired by the myths of elves and Poison Ivy. 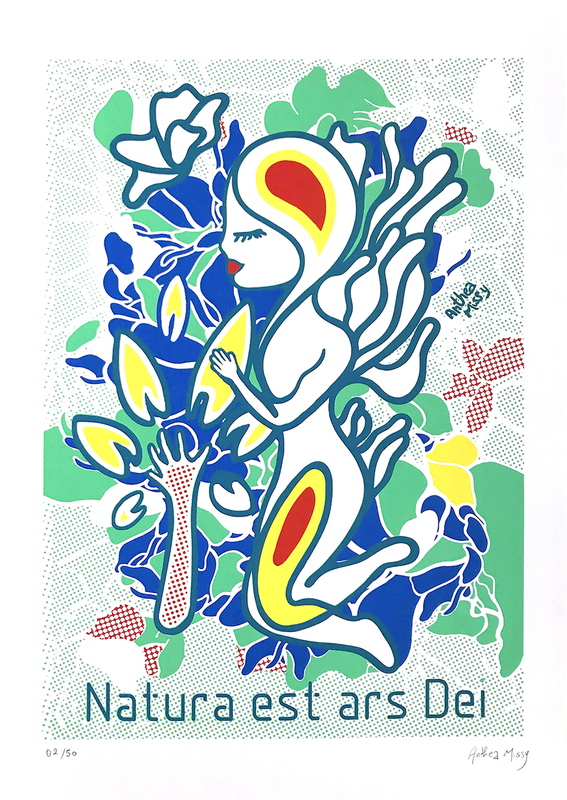 The image depicts a female character at a larval stage who is the source of everything around her. The artwork was part of a collective mural featuring three female artists and was painted during Street Art au Feminin – Feminine Street Art – held in Brussels (March 2018) in celebration of International Women’s Day. Anthea later painted the same mural (in its original colours) on a brick wall in Hackney Wick, East London, and embedded the character in ivy trees representing the circle of life. The tribute to nature Anthea delivers is not a new idea, but it is definitely a reminder of essential aspects of human life and that we are all connected and part of it. "We are Nature" mural by Anthea Missy, in Cape Town for IPAF Festival, 2018. 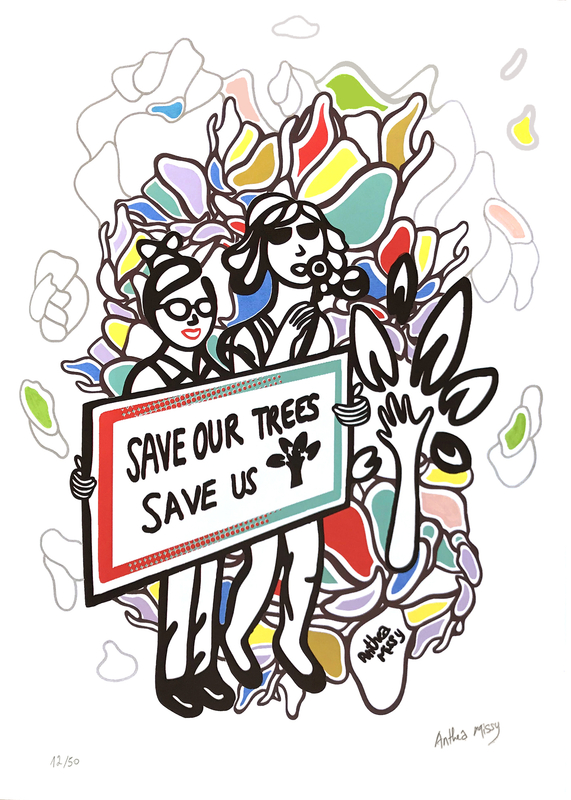 Arty-Fact: ‘Save Our Trees, Save Us’ was originally created by Anthea to support the local community of Ixelles, Brussels, where she currently resides. Anthea, together with local activists, founded a group called Mixelles. The group aims to make their neighbourhood a greener and friendlier place to live. The team launched a petition calling for an inclusive co-creation of urban space between citizens and the government. The visual was pasted to walls in the area and has brought awareness to the campaign. A large collage of ‘Save Our Trees’ was also pasted in Place Fernand Cocq, on the window of a popular pub that recently closed due to gentrification of the area despite hundreds of signatures to keep it open. Anthea was invited to the IPAF (International Public Art Festival) in Cape Town, South Africa, where she painted a large mural version of ‘Save Our Trees, Save Us’ in the popular Salt River area. She chose to highlight the recent events surrounding the Tokai Forest which involved hundreds of citizens fighting to save their precious forest even though the trees were eventually chopped down. Good To Know: Stretched canvas on wooden box frame, professionally packed and stored in humidity controlled art storage facility, CoA (Certificate of Authenticity) issued by the artist, condition report available upon request. Arty-Fact: Nowadays, many people are rejecting religion and faith. At the same time, they are struggling to find meaning in their daily life. ‘Mother Earth’ invites us to take a step back and actually look at all the beauty that surrounds us. In doing so, you’ll realise the small issues you cling to so fiercely are actually unimportant in the larger scheme of things – they are as ridiculous and enjoyable as fried eggs on toast. You’re barking up the wrong tree if you’re looking for a cheerleader in this neck of the woods! Geddit? That’s double points right there: bark… woods - kapow! Ok, off to take our meds now.